Hey everyone, it's another Friday, and another featured beer, but not a new brewery this time around as Gnarly Barley has made a few appearances always in this space. I'll be honest though, if a brewery keeps putting out good beer that I have access to, they'll find a way into a post or two of three before too long. The Gnarvana pours crazy hazy, with a grapefruit flesh shade of orange and a bubbly white head that doesn't stick around too long due to all the hop oils. The aroma is pure pineapple... just pineapple on top of pineapple layered with some pineapple juice. On the taste, you guessed it, more pineapple! There's a little other citrus in there on the taste, some orange and grapefruit to give it a bit of complexity, but the truth is, this beer is a pineapple bomb, which I personally find to be delicious. 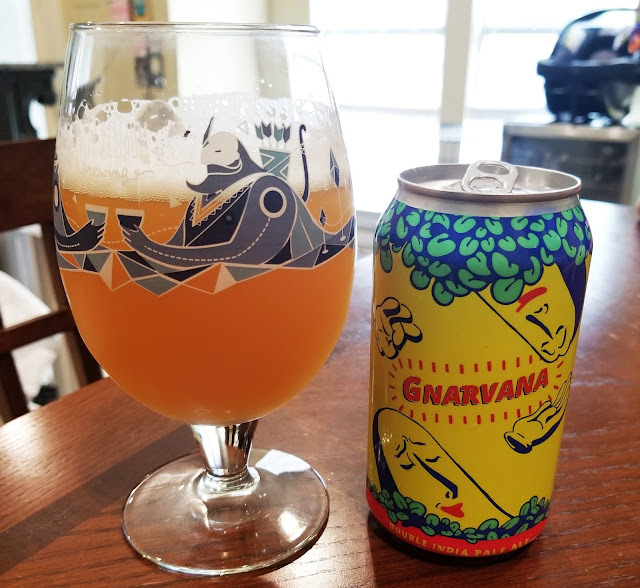 Last I saw online, there were still cans to be found at the brewery, so if you're wanting to give this a try, make the quick trip over to Hammond and find yourself in Gnarvana.